FLAVOURED 2:1:1 RATIO BCAA SUPPLEMENT IN POWDER FORM, CONTAINING 6,000 MG BCAAS PER SERVING AND VITAMIN 6. BioTechUSA’s flavoured BCAA Flash Zero amino acid powder contains 2:1:1 ratio of leucine, isoleucine and valine amino acids, which greatly enhance each other’s effect on building muscles and energising, and they have a natural, specific proportion in muscles. We have also added vitamin B6 to the product, which contributes to normal protein and glycogen metabolism, as well as to reducing tiredness and fatigue. 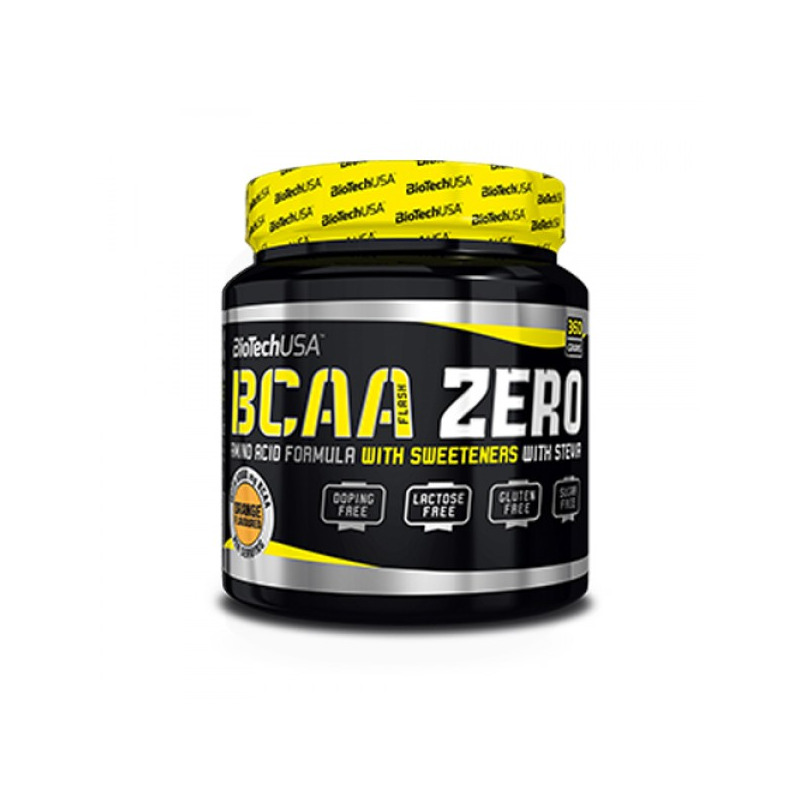 To sweeten BCAA Flash Zero, we used stevia, a natural plant-based sweetener. BCAA Flash Zero is an amino acid product in powder form, suitable for any form of training, in which we simply zeroed everything that was unnecessary: it’s free of gluten, lactose, aspartame, carbohydrates, preservatives and added sugar. Who is BCAA Flash Zero recommended to? WHY DO YOU NEED AMINO ACIDS? Amino acids are the building blocks of one of our fundamental nutrients, proteins, commonly found everywhere in human body. There are some amino acids which human body is capable of producing (non-essential amino acids), whereas the amino acids belonging to the other group (essential amino acids) are taken in with food. From all the different amino acids, only 20 contributes to shaping the structure of proteins. Amino acids are vital to all bodily functions such as digestion, liver function or wound healing. Amino acids maintain skin, ligaments, muscles, tendons, internal organs, glands, hair and nails. They also contribute to producing hormones, as well as neurotransmitting substances and enzymes. Besides, they also serve as a source of energy, as well as a carbohydrate and lipid-producing nutrient. The richest source of basic amino acids are foods of animal origin, whereas foods of plant origin often do not contain all of them. BCAA’s, that is, branched-chain amino acids, actually consist of three amino acids: valine, isoleucine and leucine, all of which are especially important for building muscles. Valine is a source of energy for muscles, and it also greatly contributes to cell metabolism. Isoleucine is an amino acid required for hemoglobin production, and it also contributes to recovery. Leucine contributes to the recovery of bones, skin and muscles, and it is also capable of increasing protein absorption in itself. The three amino acids constituting BCAA’s greatly enhance each other’s effect on building muscles and energising, and they have a natural, specific proportion in muscles. 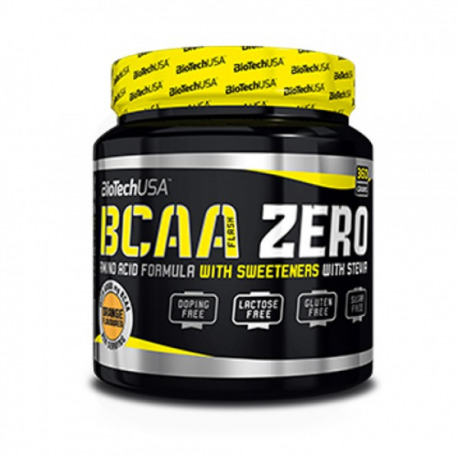 Like all BioTech USA products, BCAA Flash Zero consists of safe and carefully selected ingredients. Mix one serving (2 measuring spoons) with 300 ml water. Consume during workout and/or directly after workout. On resting days, consume between meals. L-leucine, L-valine, L-isoleucine,L-glutamine, apple flavour, acid (citric acid), anti-cakingagent (silicon dioxide), sweeteners (sucralose, steviolglycosides), salt, pyridoxine hydrochloride (Vitamin B6),colours (tartrazine*). * Tartrazine: May have an adverseeffect on activity and attention in children. Made in aplant that also manufactures milk, soy, egg and mustardcontaining foods. L-leucine, L-valine, L-isoleucine, L-glutamine,orange flavour, acid (citric acid), anti-caking agent (silicondioxide), sweeteners (sucralose, steviol glycosides), salt,pyridoxine hydrochloride (Vitamin B6), colours (tartrazine,Ponceau 4R)*. * Tartrazine, Ponceau 4R: May have anadverse effect on activity and attention in children. Madein a plant that also manufactures milk, soy, egg andmustard containing foods.